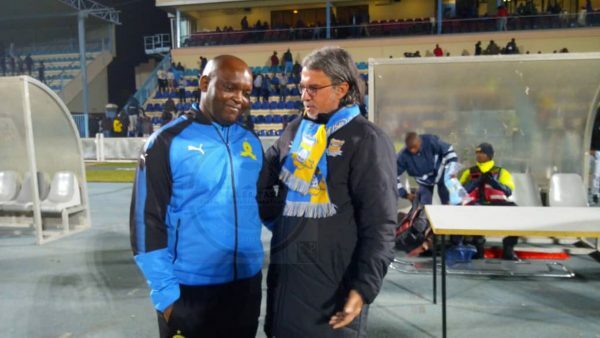 Township Rollers coach Nikola Kavazovic with Mamelodi Sundowns Pitso Mosimane. With the SA Football Association (Safa) seemingly reluctant to release Stuart Baxter, Kaizer Chiefs could announce Township Rollers coach Nikola Kavazovic as their new coach. Kavazovic posted the tweet after Rollers edged Sundowns 1-0 in a friendly match this past weekend. Chiefs are set to play Sundowns in the Shell Felix Ultra Cup at FNB Stadium on July 21. Meanwhile, Chiefs are said to have decided against renewing the contract of technical director Rob Hutting. Hutting joined Amakhosi in January, but failed to help the team win the Nedbank Cup and the league title, and now Chiefs have decided not to renew his short-term contract. – Still hope to see you on oposite bench on 21st.